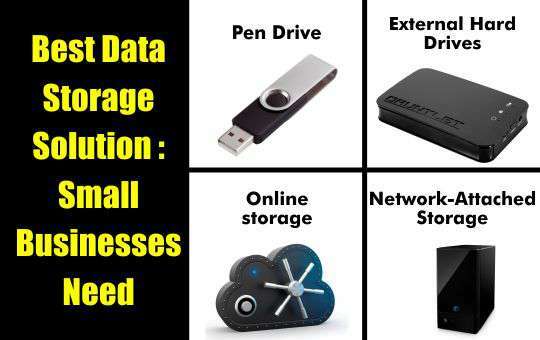 In the near future, small business will need more space for data storage. Growing e-mails, documents, presentations, databases, graphics, audio files and spreadsheets and the applications that run and protect your business require a lot of storage space. Information storing and managing its storage is the basic thing company’s have to look forward to. For that, the best way is to combine the different storage options. First, you have to look for your storage needs in terms of both capacity and physical location, then, you’ll get to know about your storage needs. Basically, these types of drives are attracting mobile professionals because the consumption of less power, small enough to fit on a keychain and containing no moving parts. Also, you can connect a flash memory thumb drive to your laptop’s USB port to back up files on the road. Not just that but, some USB thumb drives even provide encryption to protect your files if the drive gets lost or stolen. On top of that, some allow you to store your Outlook data like, recent e-mails and calendar items, Internet Explorer bookmarks, files and also some desktop applications. So, wherever you are, you can get your files only plugging in the USB drive into any computer. External hard drives is actually a very simple and comparably a reasonable way to add more storage to your computer by connecting an external hard disk drive. But there are some disadvantages of it too. Files stored on the drive only need to be backed up. And, if you need access to files on an external drive, somewhere else, then you’ll have to take the drive with you or remember to copy the required files to a USB thumb drive, your laptop’s internal drive, a CD or some other storage media. The very important thing is if there comes any natural or unnatural calamity, your data will not be protected. There are so many benefits of services that provide remote storage and backup over the internet. It benefits you, by backing up your most important files to a secure, remote server, you are protecting the data stored at your place of business. With the help of online storage, you can easily share large files with clients, partners and others by providing them with password-protected access to your online storage service, eventually deleting the need to e-mail those large files. And when you are away from your PC, you can log into your account from any computer using a web browser. But there is a flow, remote storage, particularly during an initial backup session can be slow. When you need extremely large files, you need to have higher speed network access. If you want fast, simple, reliable access to data in an IP networking environment, Network-attached storage (NAS) is the best. This solution is basically for small and mid-sized businesses who need large amounts of economical storage that multiple users can share over a network. It is also very easy to deploy, centrally manage and consolidate. It can also provide additional USB and FireWire ports, which will allow you to connect external hard drives to scale your business’s overall storage capacity. It can also offer print-server capabilities, which lets multiple users easily share a single printer. NAS solution may also include multiple hard drives in a Redundant Array of Independent Disks (RAID) level 1 array which includes, two or more equivalent hard drives like, as two 250 GB drives, in one network-connected device. In this solution, files written to the main drive automatically written to the second drive too. It means that if the first hard drive dies, you’ll still have access to all your applications and files on the second drive. One more benefit is there, it can also offload file serving from other servers on your network, increasing performance. On top of that, it will allow you to consolidate storage, increasing efficiency and reducing costs, simplify storage administration and data backup and recovery, and also allow for easy scaling to meet growing storage requirements. So, before you invest in any data storage solution don’t forget to consult with a trusted IT advisor on which solution will best meet your business’s current and future needs. Start planning now for your future storage needs, so you will not have to waste time and money in near future.